DOWNTOWN BROOKLYN – Governor Andrew Cuomo announced on Tuesday that Downtown Brooklyn will receive $10 million from New York State’s Downtown Revitalization Initiative (DRI) which works to “transform communities into vibrant neighborhoods” while boosting local economies. $10M from the Downtown Revitalization Initiative will continue the growth and momentum of downtown #Brooklyn. Now in its third year, the DRI program will invest $100 million into ten additional downtown neighborhoods across New York State. Downtown Brooklyn’s DRI win means the area will receive $10 million in state funding and investments to revitalize the borough’s downtown neighborhood and to help develop new growth opportunities. Brooklyn joins fellow NYC region winners Jamaica, Queens—winner of the program’s first round—and the Bronx which won last year’s DRI. The DRI program provides funding for “much needed critical infrastructure in the Downtown core to create welcoming and safe connections to key assets, ensure equitable and accessible future growth, and improve wellbeing and job opportunities in traditionally underserved communities,” according to a release announcing the award. With financial support from the DRI, Downtown Brooklyn will expand educational and entrepreneurial opportunities and connect Downtown’s “cultural hubs” such as the Brooklyn Cultural District and DUMBO to surrounding communities. 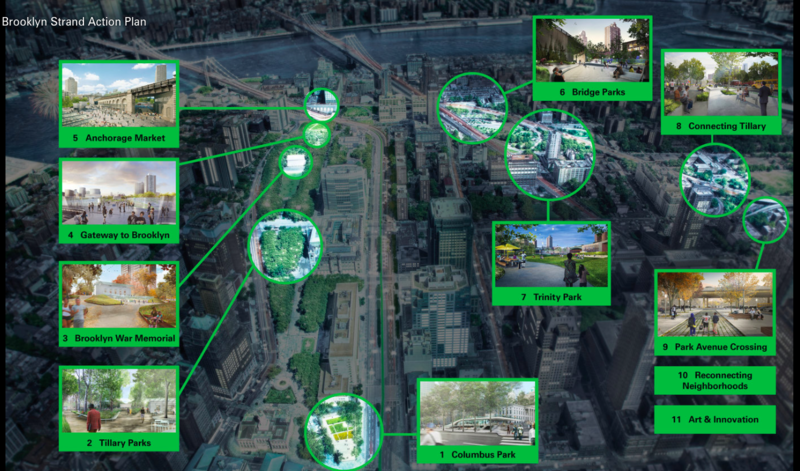 A Local Planning Committee—borough representatives, community leaders and stakeholders as well as “private sector experts” and NYS planners—will develop a Strategic Investment Plan to revitalize Downtown Brooklyn, according to the release. The Downtown Brooklyn Plan will study the neighborhood and identify economic development opportunities, including housing, transportation, and community projects. The Downtown Brooklyn Strategic Investment Plan is scheduled to be completed in 2019. In selecting the winning downtown districts, the NYC Regional Economic Development Council reviewed proposals from various communities within the region. Some of the neighborhood criteria the Council considered include: “well-defined boundaries,” size, potential for job growth, ability to attract diverse residents and workers, ability to create/implement quality of life policies, and the community engagement during the proposal process.